We talk mostly about crowdfunding campaigns on the blog but there’s another type of crowd opportunity that has been just as important over the last few years. Crowdfunding loans has changed banking in America, opening up the financial system even for people with bad credit. I’ve used peer-to-peer lending twice to get loans after destroying my credit score in 2008 and it saved me from having to turn to payday lenders. I’ve since used personal loans for a remodeling project even after rebuilding my credit. I now invest in peer loans to give other borrowers the same opportunity I had. Crowdfunding a loan can be your best option to avoid the financial trap of cash advances and high-interest loans. I’ve separated this crowdfunding loans guide into five sections to help find the best p2p site for your unique needs. I’ll also cover the personal loans application process and key points to remember to get the best deal on the money you need. The definition of crowdfunding loans gets a little blurry if you include all the types of online loans like personal loans. The strictest definition is just loans on peer-to-peer lending sites where investors loan money directly to borrowers. But what’s the difference really for a borrower? Whether it’s a personal loan or p2p, it’s money through an online loan platform and coming from different sources. 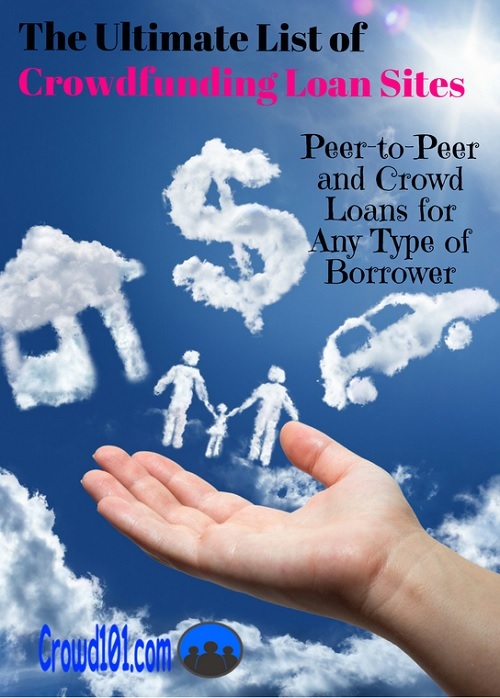 For the borrower, a p2p crowdfunding loan is really no different from a regular bank loan. You fill out an application for a set amount at a set interest rate and fixed monthly payments. The loan is approved depending on your credit score and other factors. The loan is funded by people that need a reliable investment with consistent cash flow. That’s exactly how traditional bank loans work even if you don’t see it. Banks don’t keep your loan. They may keep collecting the payments but they sell their loans to investors so they can make more loans. The one difference between crowdfunding loans and bank loans is that peer lending is less rigid compared to a loan from your local bank. Instead of just one loan officer making the decision, your loan has a chance to be approved by thousands of investors with different standards. Being able to take your loan directly to the crowd means you’re more likely to get approved even if you have bad credit. There are always investors willing to take a chance on your loan. Not all peer-to-peer lending sites are the same. By specializing in a different part of the loan market, p2p websites can attract investors that want those specific types of loans. Some sites attract investors that want more stability, other websites have investors that are willing to take more risk for a higher return. As a borrower, it’s important to know which loan websites are best for your situation. Bad credit generally means a credit score below 620 FICO. Below this point is called sub-prime credit and most traditional banks have rules against lending to these borrowers. 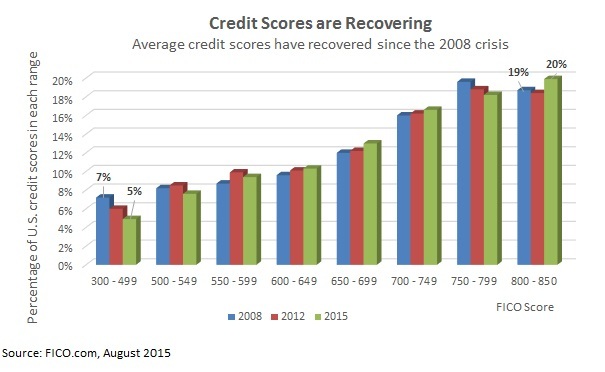 The problem is that at least four-in-ten Americans have credit scores below prime, and that’s after scores have increased over the last decade. Is your credit score high enough for a bad credit crowdfunding loan? So you’ve got almost half of households that can’t get a personal loan from a bank. One of the biggest factors in the growth in crowdfunding is to fill this demand from bad credit borrowers. Total peer-to-peer lending passed $7.6 billion last year and continues to book double-digit annual growth. For crowdfunding loans on bad credit, I see two websites recommended most. 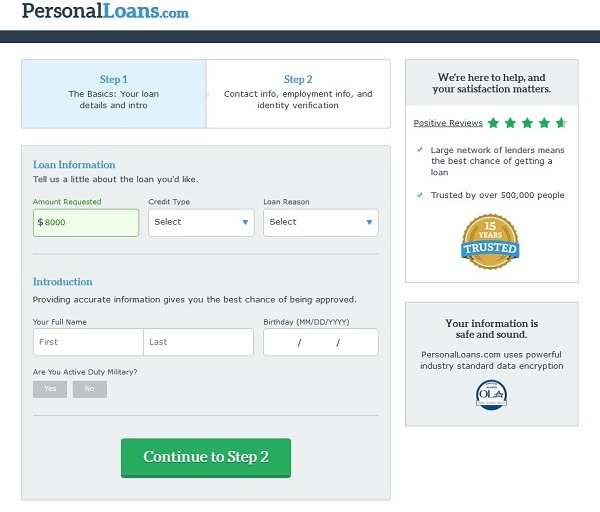 PersonalLoans.com is the lender I’ve used most, first for a debt consolidation loan and later for a home improvement loan. One of the biggest benefits to the site is that it’s not a lender itself but a loan aggregator. This means it has a network of lenders that will look over your loan application to decide if they can approve it. The site offers three types of loans from peer-to-peer to personal loans and even bank loans. The credit score required for a personal loan is as low as 580 FICO, making it one of the easiest websites on which to get a loan. Fees and rates will depend on the lender and your credit score but generally range from 10% to 30% for p2p and personal loans. This is going to be higher than loans on good credit scores but I’ll show you a way later on to get quick approval on a loan and then lower your interest rate later on a refinance loan. NetCredit is another p2p site that specializes in bad credit installment loans. The platform isn’t available in all states yet but is a good option for small loans up to $10,000 and for up to three years. NetCredit uses a special lending approval model called My ScoreSaver that uses other factors besides just your credit score to approve loans. Another benefit to NetCredit is that it charges no origination fee, application fee or even late fees on loans. That gives you a lot of flexibility to use the site for a quick loan without having to worry about paying a lot of money in fees. One of the biggest problems for students and graduates is that they might not have bad credit but they usually don’t have any credit at all. Since most banks approve your loan based solely on your credit score, which is based on your credit history, you can’t get a loan unless you’ve already paid off other loans. Upstart is a startup lender specifically launched to help students and graduates get a loan without credit. Instead of just focusing on your credit history and FICO score, Upstart has a unique lending model that takes into account education, work history and other life factors. The minimum credit score for loans on Upstart is 640 but the website will also take into account your academic record if you have poor credit for lack of credit history. That doesn’t necessarily mean all graduates will be able to get a loan but it’s definitely a plus. Upstart does charge an origination fee of up to 6% and a late payment fee of $15 or 5% of the past due amount. There’s a check processing fee but choose to have the payment withdrawn automatically from your account and they’ll waive the fee. SoFi offers the biggest selection of peer loans for different purposes including student loan refinancing, home mortgages, refinancing and auto loans. The website, formerly called Social Finance, started targeting only student loans but has since expanded because there’s so much demand for other types of loans. You might not have heard as much about SoFi but it’s one of the largest p2p loan sites with over $6 billion in loans originated. SoFi offers fixed and variable rates on student and parent loans. Interest rates start lower on variable-loan rates but your payment can go up if interest rates rise. With the AutoPay rate deduction, rates on student loan refinancing can start as low as 3.2% and even bad credit borrowers can get a rate of 7% or lower. Building your credit score to 680 will open up other crowdfunding sites for a loan but rates are still going to be fairly high. To get the best rates, you’ll need to increase your FICO to 720 or above. The great thing about crowdfunding loans is that you can pay them off early without paying a penalty and many websites don’t charge an origination fee. That means you can get the money you need from a site that approves bad credit borrowers, start making payments and building your credit score, then refinance your loan at a lower interest rate on one of these good credit sites. Lending Club is the largest peer-to-peer lending site in the world, helping fund more than $31 billion in loans alone. Almost two of every three borrowers on Lending Club report using their loan to pay off other debt like personal loans and credit cards at a lower rate. Lending Club started making small business loans last year but it hasn’t taken off as fast as the peer-to-peer loan space. The company issued shares on the New York Stock Exchange in 2015 and was able to fund a lot of growth and new loan outreach. Loans are made on terms from three to five years with fixed rates and no prepayment penalty. The site does charge a 5% late payment fee and a fee for rejected payment but will work with you to keep you on track. Lending Club recently announced it would stop making as many loans to bad credit borrowers so you’re best bet is to start on some of the other loan sites if you have less than a 700 credit score. SoFi also fits in here because it generally requires a higher rate to approve your loan. If you can get your loan approved, you’ll get some of the lowest rates available online. Since crowdfunding sites run what’s called a soft-pull of your credit that doesn’t affect your score, it’s always best to apply to a few different websites to see who will approve your loan at the lowest rate possible. Peerform isn’t as big as some of the other crowdfunding lenders but has actually been sold to a new investor group within the last year and is looking to grow faster. I haven’t had as much experience with Peerform but have interviewed people in the company to understand how the lending model works. Rates and fees on Peerform loans are similar to other sites including an unsuccessful payment fee of $15 and a late payment fee of 5% on your payment amount. Crowdfunding grew up as a way to fund non-profit causes and social campaigns. Besides crowdfunding for personal loans, there are websites that specialize in social lending. Crowdfunding a loan for your social cause is a mix of a loan and fundraising. It’s much faster than running a crowd campaign and requires none of the work. Some of the loan from many of these peer websites may be forgiven after a certain time but make sure you read all the rules on each site before you take out a loan. One last benefit of crowdfunding a loan rather than running a campaign for your social cause is the tax consequence. If you’re not a designated 501(c)3 non-profit, you’ll have to pay income taxes on any money raised through crowdfunding. I know more than one non-profit that forgot to budget for these taxes and it almost ruined them. You don’t pay taxes on any money raised with a crowdfunding loan and the interest may be deductible. Kiva was the first micro-lending website to launch and focuses on providing loans for projects in low-income or bad credit areas. Kiva has partnered with nearly 300 social crowdfunding institutions around the world to make quick loans to social projects. Borrowers use a messaging system to keep lenders updated on the project. A lot of lenders have formed Lending Teams that make loans and provide advice to community project owners. Zidisha is another peer-to-peer platform for loans, mostly to developing countries and for small business purposes. What makes Zidisha different is that it is more of a peer-to-peer business mentoring program than it is a lending site. Entrepreneur lenders offer funding and advice to projects in developing countries. New loans on Zidisha usually start at $50 but a project can borrow more in other rounds. There is no interest rate on loans so no investor return. Borrowers pay a 5% fee on the loan and a registration fee which pays for the platform costs. United Prosperity is called an impact lender because it focuses on small businesses and projects that show they can make an impact in the community or region. There’s also no interest on United Prosperity loans so it’s a true social lending site. Lenders can fund a social program either as a loan or as a part of the collateral the borrower uses to get a larger loan. While a lot of the social cause crowdfunding lenders will provide low- or no-interest loans to small businesses, you usually have to show a social component to get the loan. If you’re a traditional small business owner, looking to make a profit, you’ll need to try out one of the crowdfunding loan sites specifically designed for businesses. StreetShares is a p2p platform launched by and for veteran business owners. The platform provides loans of up to $50,000 to any small business application but special preference is given veteran-owned projects. The company invests 5% of its own money into every loan. One of the best benefits to StreetShares is that it operates on a reverse-auction process for interest rates. That means investors agree to fund parts of the loan at a certain interest rate. Your loan funds with the investors offering the lowest rates. Like most small business loans, you apply with business financials including sales and assets as well as your own personal credit. ApplePie Capital provides loans in all 50 states for franchises. This is different for most crowdfunding small business loans because you can only use the money for one of the platform’s approved franchises. That limits you a little but also helps get a loan because the company knows the franchises in which it invests and is more confident that the loan will be repaid. Borrowers pay a 5% origination fee for loans but can lower it to 3% if they use their own social media network to fund the loan. You’ll also have to provide financial history and other personal data. Again, the crowdfunding loan process is basically the same as getting any loan from the borrower’s point of view. Most p2p websites have an online application that takes less than five minutes and you get instant approval based on your credit. I’ll walk through the lending application for PersonalLoans here but they’re all basically the same. Your biggest decision is which crowd platform will approve your loan at the lowest rate. The first thing you’ll see when clicking through the links to a peer-to-peer lender will be a basic signup form. You’ll need your contact information, annual income and how much you want to borrow. The lender will run a soft-pull on your credit which is different from a hard inquiry that gets reported on your credit report. This is important because it means you can apply to different crowdfunding sites to make sure you get the lowest rate possible. The website will make a decision based on your credit score and the types of loans its investors are willing to fund. The whole process takes less than a minute and you’ll be shown the interest rate and exactly how much your monthly payments will be. The website will give you at least a day to decide on the loan terms so you’ll have plenty of time to find a lower rate and pick the best loan. If you agree to the terms, the money can usually be deposited in your account from three to five business days, sometimes within 24 hours. After that, a crowdfunding loan is exactly like any other loan. You send in the monthly payment directly to the website which will send you an updated loan balance every month. Monthly payments include principal and interest so after three to five years, your loan is paid off completely. Crowdfunding can be a great opportunity to get the money you need when your credit score is too low to get approved at a traditional bank. Crowdfunding loans are more convenient than bank loans and help to increase your credit score just like any other loan. Just like any loan, there are things you need to remember before going to any of the crowdfunding sites listed in this guide. Check out at least a few p2p websites before accepting any loan. You’ll have a better shot at getting approved and finding the lowest rate available. You can get a crowdfunding loan on bad credit but it’s always best to spend a few months improving your credit score to get a better rate. Understand that there are difference crowdfunding loan sites for different needs, from personal loans to small business and social causes. Never use a loan for spending on things you don’t need. There’s no shame in borrowing money as long as you use it to create financial independence instead of digging yourself farther in debt. Crowdfunding loan sites have grown out of one reason, because the banks have cut off bad credit borrowers from the money they need. The peer-to-peer revolution is a mix between social media and lending, connecting borrowers and investors directly for lower rates. 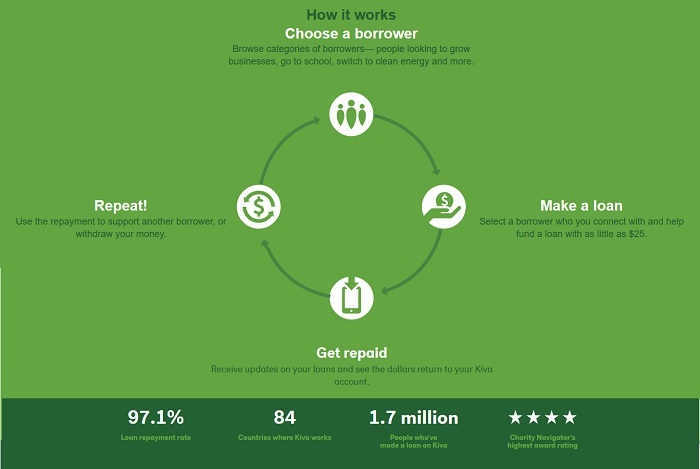 Use this crowdfunding loan guide to make a better decision and get the money you need now.